Welcome to the FAQ section. We will strive to answer every single question so if you haven't found what you were looking for here, please shoot us an email or give us a call. We would love to hear from you! In mermaiding, we use monofins, sometimes covered by colourful tails, to propel our bodies through the water like a fish, or a dolphin - or a mermaid. Swimming with a monofin is much faster than conventional swimming so people experience a completely new way of moving through the water, which is exciting and exhilarating. Kids describe the activity as “magical”. No wonder that mermaiding is fast becoming a world-wide fitness trend, very popular in North America, Germany and South-East Asia. What are the benefits of mermaiding? 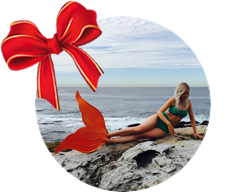 The benefits of mermaiding are far reaching, both in fitness and simple enjoyment. They include higher endurance, higher flexibility in shoulders, spine and hips, less back pain, better self-esteem and a happier soul because you are able to get away from the hustle and bustle of everyday life for a while and have fun! At No Ripples we strive to provide a holistic approach to fitness, so we combine water activities with core muscle strengthening, yoga stretching and breathing techniques. The incredible speed drawn from the monofin is not only a ton of fun, but is also extremely beneficial to a swimmer’s body. Everyone! Mermaiding is suitable for kids aged seven and older who can confidently swim at least 25 metres unassisted and for men and women who want to stay fit or to get fit – for example, mothers who want to strengthen their core and lower back before or after childbirth. By the way, mermaiding is not only for the girls. Boys can swim without the costume, just using a monofin, or a shark fin, which is also loads of fun. What can I expect from an adult fitness class? Expect to be challenged and to step outside your comfort zone. We strive to provide a holistic approach to fitness so we use a combination of land and water activities to make you feel fit and fabulous. We create a playful environment that lets people forget that they are actually training hard. Only the sore stomach muscles afterwards will remind you of the serious nature of the class. Monofining is a stripped-down version of mermaiding and the most efficient way to move through the water. Monofining is a highly respected sport with worldwide competitions and even World Championships! Tens of thousands of people worldwide train with monofins. Monofining is most efficient when the movement starts at the rib cage and continues as a wave throughout the whole body with the highest amplitude at the feet. The dolphin swimming motion engages all of the swimmer's muscles through the legs and the core. The monofin also helps to engage calf and thigh muscles, increase ankle flexibility and strengthen the core and lower back. I've never done monofining or mermaiding before. Will I be able to do it? Absolutely! How quickly you become competent depends on your existing swimming ability and flexibility, particularly around your hips and shoulders. Mostly it will depend on your willingness to try. Most people master the basics of mermaiding in a few classes and then move on to more advanced techniques such as tricks and synchronised mermaiding! We will guide you from the very first moment you put a monofin on your feet through to mastering a perfect dolphin kick while controlling your rhythm and speed. Are you going to teach me how to hold my breath for a long time and how to go deep underwater? Glad you asked! In summer 2017 we are going to run 10-week mermaid course, which will help you to master basic monofining techniques. We will then incorporate elements of synchronised swimming to enhance your experience as a mermaid. You will be led by Vicki, our synchronised mermaid instructor. Together you will work on fluidity of movements, learn to move to the rhythm of music and perform mermaid tricks to create a beautiful synchronised mermaid routine! Let's be honest, swimming laps is boring! We believe that play for adults is hugely beneficial. Just because we are grown-ups doesn't mean that we should take ourselves so seriously! 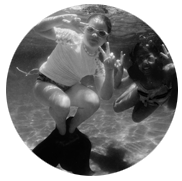 So we incorporate lots of playful elements throughout our classes, such as swimming with rubber balls, swimming through hula hoops, picking up submerged objects, playing games and having mini-competitions. Our instructors create a playful environment that lets people forget that they are actually training hard. Is mermaiding safe for my child? As a mother of three, Michaela had to be satisfied with the answers to this question. Yes, mermaiding is safe. But, like any other sport, particularly water sport, it needs to be taught properly and practised diligently. Would you let your child go surfing without taking a class first? NO! Then, don't assume that your child will know how to swim with a mermaid tail. 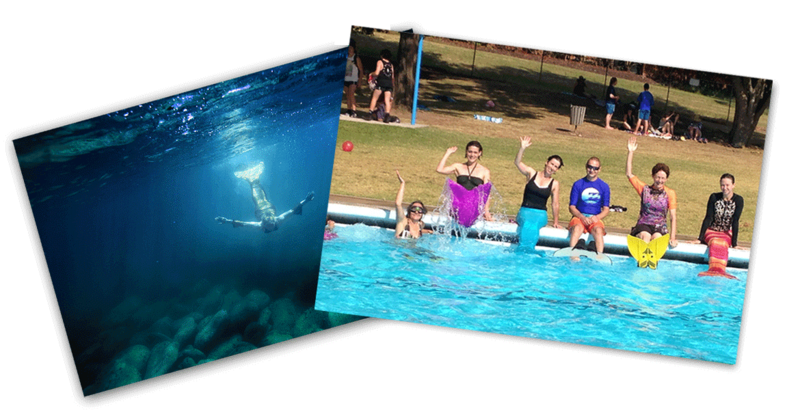 Book our Mermaid Experience Classes so that you and your child can learn how to swim with a mermaid tail safely.